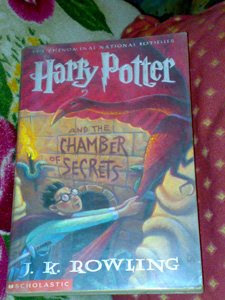 - Chamber of Secrets is the first book in the series to directly provide a timeframe for the series. Nearly Headless Nick celebrates the 500th anniversary of his death at Halloween, and it is stated that he died in 1492, placing the events of this book during the 1992-93 school year. - This book is thematically linked with the sixth book of the series, Harry Potter and the Half-Blood Prince. In fact, Half-Blood Prince was the working title of Chamber of Secrets and certain "crucial" plot information from that book was intended to be placed in this volume, but Rowling ultimately felt that "this information's proper home was book six." Of course, when you read a serial novel you should at least continue on the story by reading its sequels. This, as well, applies with the Harry Potter books. Although I can state a fact that you are not just forced to read the next books just to finish the series, but you try to read the sequels because they are worth reading. I was bewitched with the first one, so naturally I read the second book expecting the same quality that I have experienced with "Sorcerer's Stone" or "HPSS". I was not deisappointed with my decision to read on with the series and once again I was baffled by the magical world of Hogwarts. Honestly, by the time I read this I have already read The Prisoner of Azkaban and The Goblet of Fire. It was not a spoil since the author didn't care to repeat the stories in the succeeding books, which is good actually. There are no available copies in any bookstore after the surge of the release of the first Harry Potter movie. Lucky for me, I was able to find on in a very old book store that doesn't exist anymore. What I like the most about this novel is the detective feel about it. A crime was executed and questions surrounding the crime scene must be answered to convict whoever was responsible. This is very unfortunate for our beloved Harry Potter, because most of Hogwarts thinks he is the culprit. Everyone is in danger, even those who are very close to him. J. K. Rowling has once again showed us how superb she was in story telling. Her usual concoctions of hilarity, mystery, intrigue and magic has delighted her fans both young and old. This book is one of my most favorite books in this series. The very same reason why I wanted to complete the series again in hardbound format. Fate does really intervene, because I cannot once again find a hardbound copy despite having already bought Prisoner of Azkaban. Hopefully by the end of the month it will be available.